Can't get hold of an older journal article anywhere in Cambridge? 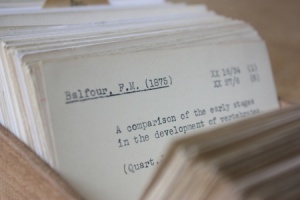 Try the Balfour Library's extensive collection of over 60,000 scientific offprints dating from the 19th and 20th centuries. There is an author card catalogue for the collection which is located at the back of the Newton Room, the area of the library where the photocopier is situated. There is also a collection of offprints, Studies from the Zoological Laboratory Cambridge, that have been written and donated by members of the Department of Zoology since 1880. This is by no means a complete collection of all the articles published by members of the Department of Zoology, since the number of offprints received by the Balfour & Newton Libraries for this collection has decreased dramatically in recent years. The Wigglesworth Offprint Collection was donated in 1991 by the renowned entomologist Sir Vincent Wigglesworth (1899-1994). The card catalogue that accompanies the collection is located at the back of the Newton Room. More information on Wigglesworth collections belonging to the Balfour & Newton Libraries can be found on the Special collections page. Alternatively, we provide an inter-library loan service for a subsidised fee – ask the Senior Library Assistant for more information or see the Inter-library loans page.